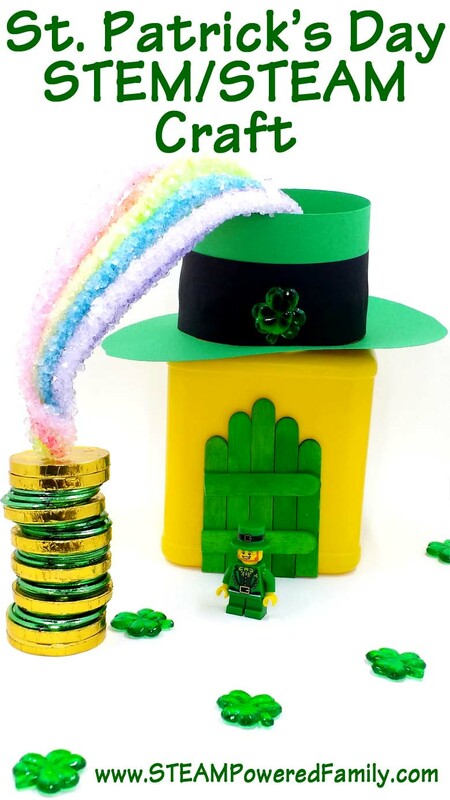 St. Patrick’s Day is coming up fast and to help celebrate the arrival of little leprechaun’s everywhere I challenged the boys to build a display using STEM and STEAM. The results of our St. Patrick’s Day STEM/STEAM Activity were fantastic! St. Patrick’s Day is such a fun holiday. I think one of the reasons I love it is because it signals the waning of winter and the slow, but definite, arrival of spring. This year our winter was very mild, but I still welcome the end of the snow and cold and the arrival of some nice weather so we can get outside and really enjoy the outdoors again! To celebrate the upcoming St. Patrick’s Day I wanted the kids to design a little display for our homeschool room. My boys are not big on doing crafts, but add a little science in and suddenly the project is much more interesting! Last Halloween we made crystal decorations and then again at Christmas we made a crystal wreath. So for this project it was decided that we should do a crystal rainbow. The boys went through the pipe cleaners in our tinker space and picked the colours they wanted in the rainbow. We have been using lots of pipe cleaners lately and I was missing some of the main colours (ROY G BIV – Red, Orange, Yellow, Green, Blue, Indigo, Violet), so they had to substitute for some similar colours. 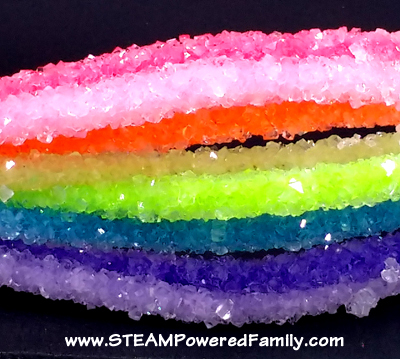 Once they had a nice rainbow of colours we twisted together the ends so they would stay together, then submersed them in our crystal solution: 3tbsp of Borax for every 1 cup of warm water. For our container we needed 7 cups of water and 21 tbsp of Borax. My oldest did the math. Then we let it sit for 24 hours in the solution. My youngest kept track of the time. The colours turned out amazing! 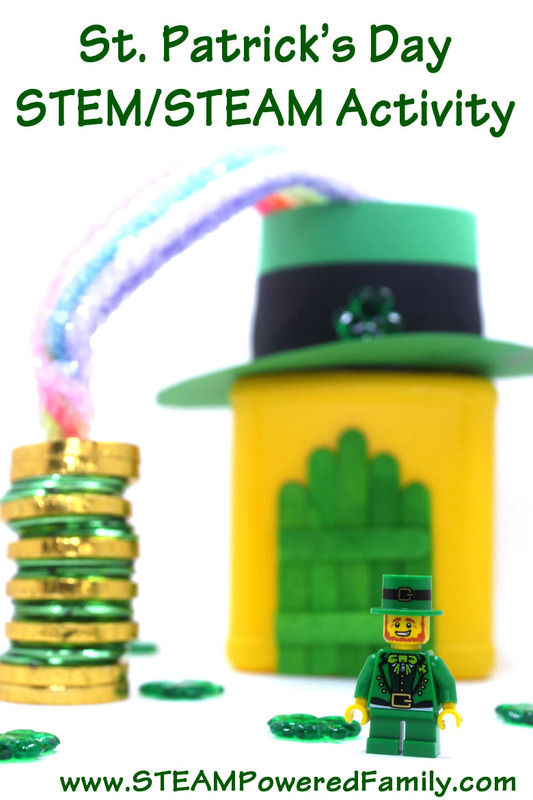 While the crystals were forming the boys went on a hunt through their Lego and found a Leprechaun minifig. He came in one of their minifig blind packs which my boys love to collect. Next they had to start building their structure. Going through our recycle bin and tinker space (learn how to build your own tinker space here!) they found an empty cornstarch container that was a great gold/yellow colour. They decided it would make a fantastic leprechaun house. Using a ruler they measured out the crafting sticks to make the door. Then they made the hat/roof. To do this they used a protractor from their math set to measure and draw the circle for the brim of the hat. I love introducing my boys to math tools in such a fun and non-threatening way. Once the crystal rainbow was finished the boys decided the rainbow had to land on a pile of gold and treasure! Using some chocolate gold coins and green leprechaun coins they created a pattern for their pile of treasure: 1 gold coin, 3 green coins, 1 gold coin, 3 green coins. Then they finished the top and bottom with an extra gold coin. It took a little engineering to get the rainbow to fit nicely and stay in place (the crystal rainbow is quite heavy), but with a few containers placed inside the house they got everything to fit together. To finish things off they sprinkled our display with some shamrocks. I think they did a great job and now we have a fancy new seasonal display in our homeschool room. 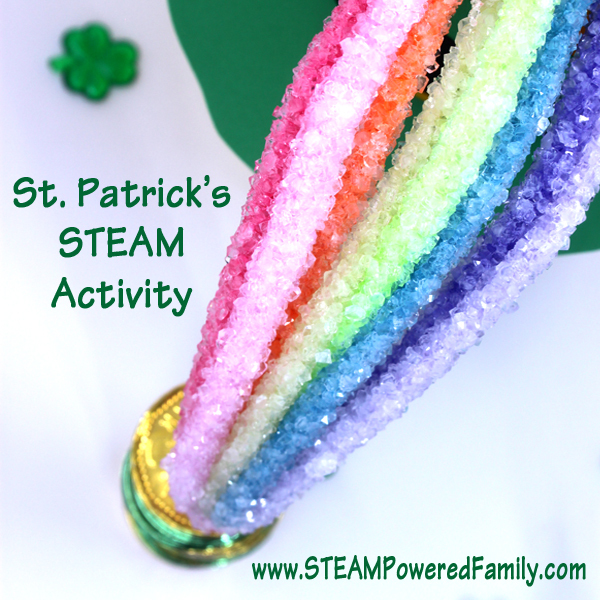 Have you done any St. Patrick’s Day STEM or STEAM Activities? That crystal rainbow is awesome! My kids would love to make their own on St. Patrick’s Day next week. Thanks for linking up with the Everything Kids Pin & Link Party. Wow! We have done our share of rainbow activities, but I don’t think any of them were as exciting as this one looks! We’ve been busy inventing Leprechaun traps lately. I think we have enough to cover the whole house the night before St. Patrick’s Day!